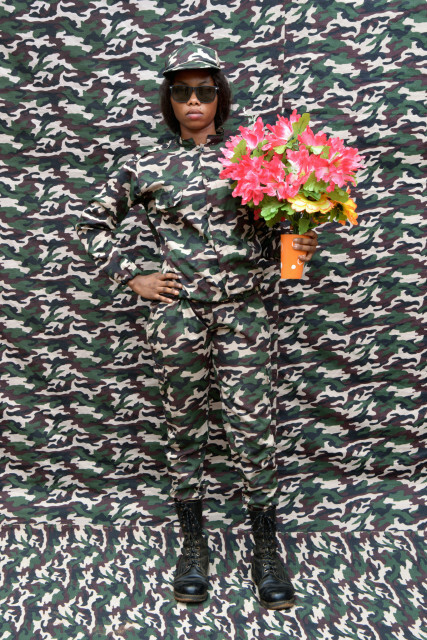 Jack Bell Gallery is pleased to present a body of work by Bienese photographer, Leonce Raphael Agbodjelou. In this new series, Agbodjelou further develops his interest in locally designed Dutch imported textiles. The coloured, patterned fabrics from the artist’s earlier work have been swapped with military camouflage to confound boundaries between background, foreground, person and clothing. The images form part of his ongoing portraiture project, 'Citizens of Porto-Novo,' which captures the people of Benin's capital. Shooting with natural light and drawing on a history of West African studio photography, Agbodjelou interprets the experience of a generation caught between tradition and progress. The artist is one of the pre-eminent photographers of the Republic of Benin. Born in Porto-Novo in 1965, he was trained by his father, the world-renowned photographer Joseph Moise Agbodjelou (1912-2000). Leonce is the founder and director of the first photographic school in Benin and president of the Photographer's Association of Porto-Novo. His work has been exhibited at Saatchi Gallery London, Seattle Art Museum, Fowler Museum Los Angeles, Brooklyn Museum, Vitra Museum, Guggenheim Museum Bilbao, Tel Aviv Museum of Art & Camden Arts Centre, London, among others. Acquisitions have been made by the National Gallery of Canada, Brooklyn Museum, Carnegie Museum of Art, Pittsburgh, Kelvingrove Museum, Glasgow and Pitt Rivers Museum, Oxford.